The Females Advancing Clinical and Translational Science (FACTS) group will begin its new four-part Fall FACTS Series on September 24. 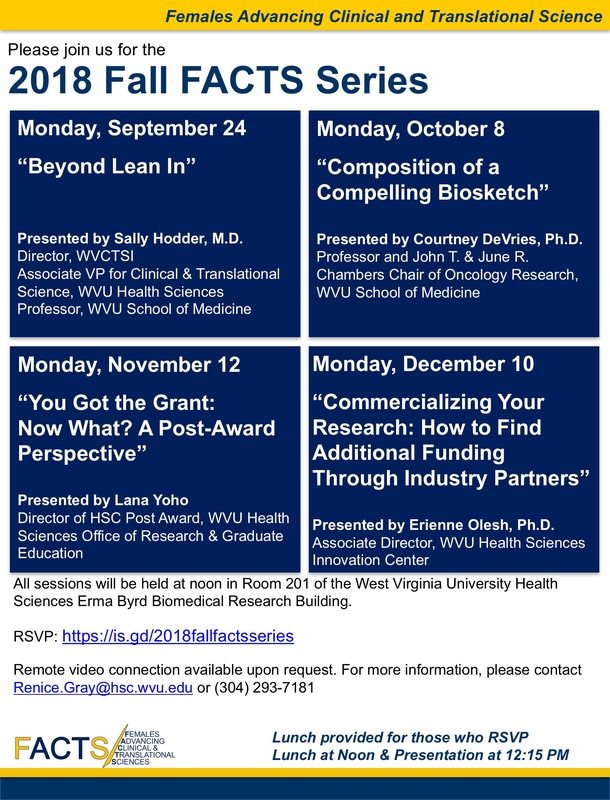 For the first entry in this series, Sally Hodder, M.D., WVCTSI director and associate vice president for clinical and translational science at WVU, will present “Beyond Lean In.” This presentation will focus on maximizing leadership opportunities. This event will take place Monday, September 24 from 12 to 1 p.m. in room 201 of the WVU Health Sciences Center Erma Byrd Biomedical Research Building. Future sessions in this series will take place October 8, November 12, and December 10. RSVP here.